Discussion in 'Android Tablet News' started by dandroid, Nov 3, 2010. 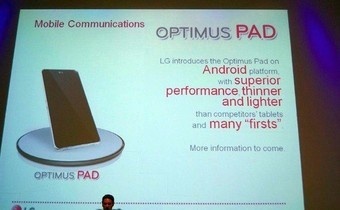 Details leaked today that LG could be gearing up for a 8.9" Android Tablet launch during the first quarter if 2011. The leak came directly from a LG rep who also mentioned the tablet known as the Optimus PAD will be running the "HoneyComb" version of the Android OS. It's still unclear whether this will be Android 2.5 or Android 3.0. Hardware specs for this device will include the dual-core nVidia Tegra 2 chip. Now if the price is right, sounds like we'll have a win/win combination on our hands.